After working together for just shy of two weeks, it was time to present the design briefs to our partner, the National Museum or Nasjonalmuseet. As outlined in the project description, the students worked together to develop a design brief detailing an activity for the museum’s new location for families. Each team prepared both a presentation to be given on the 31st as well as a written document to be left with the museum for more detailed review. Tom and Kari’s team practice their presentation. Presentations were held downtown at the National Gallery in the same auditorium where the project was assigned on the 19th. Each team gave a 15 minute presentation which were followed by a question and answer session. It was incredibly impressive to see how far each team was able to come in such a short time. Teamwork takes quite a bit of time to finesse and to do so in such a short period with team members who are not only new to you, but from a different country entirely, and to reach the level of finish that each team achieved is quite remarkable. August and Heather sharing some of their research. Stephanie and Kiernan presenting their design brief. Professor Pierroux and myself were very proud of the work presented. The presented activities provided for many thought-provoking questions and suggestions for the museum to consider. Of the 5 briefs chosen, the museum went on to select three briefs which the UTK students will now take further towards a prototype to be presented on the 21st of May. Proposed activity: A series of puzzle-based activities that stimulate participation, dialogue, and inquiry learning between all members of a family through the lesser known works within the Collection Highlights collection. 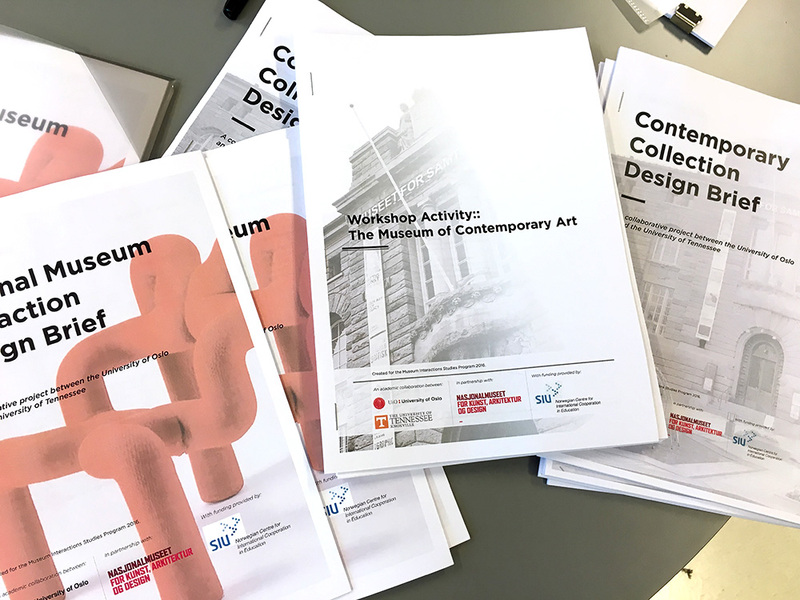 Proposed activity: Series of activities located outside the museum, and around Oslo, that engage families through physical interaction and dialogue. Inspired by the work of Christian Boltanski. Proposed activity: A workshop that allows families to first tour the exhibition for inspiration and follow up with the design of their own object in the studio workshop using 3D printing technology. Proposed Activity: Multi-sensory game that requires equal participation from each family member to solve a problem. Multiple prompts are woven together with a background narrative. Proposed activity: Hands-on workshop in which families work together to generate art related to a specific exhibit to learn the six principles of art. There has been quite a bit of interest in this collaboration outside of the working teams. Staff from the UiO research paper and UiO website were on hand to interview the students afterwards.